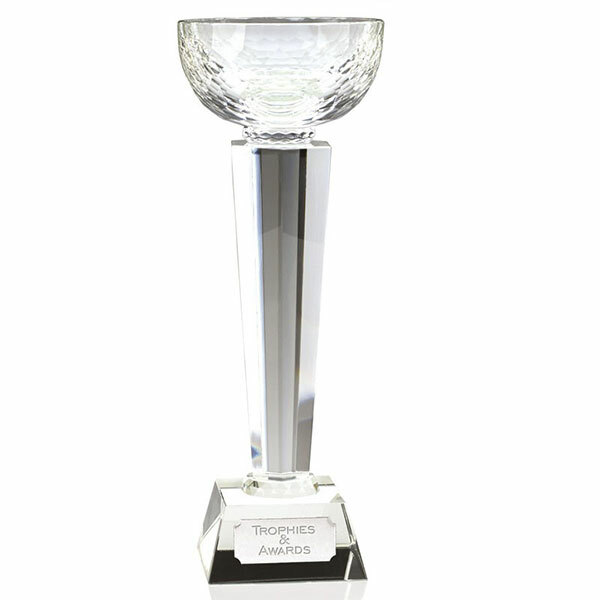 Stunning optical crystal award, 9.25in tall and offered with low-cost engraving. Featuring multi-faceted semi-circular cup set on tapered column and mounted on clear glass base. A stunning optical crystal awards trophy, suitable to grace presentation events at all levels, yet offered at down-to-earth prices for such a quality award. These 'Elite Cup' awards are crafted in flawless optical crystal, a material that refracts light as it passes through to crate a myriad of colours and effects. The 9.25in tall award comprises a multi-faceted semi-circular cup set on a tapered clear glass column and mounted on a clear glass bevelled base. They can be engraved on a metal plate attached to the base. Each award is supplied gift boxed, ready for you to present at your awards ceremony.